A Little Pre-Juggling Season Practice in Honor of the US Women’s World Cup Start! I was super excited to watch the US Women in their first World Cup match against Australia yesterday! 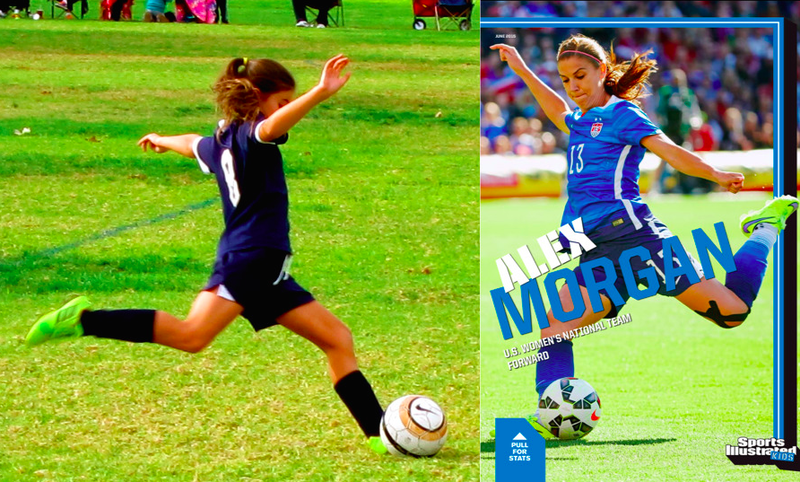 I saw this cool picture of Alex Morgan in Sports Illustrated Kids, and it reminded me of a picture of me playing last season. 🙂 I know players like Alex Morgan work super hard to get where they are, and they never get to stop working. That’s what I hope to do this summer, in order to raise as much money as possible for the kids at St. Jude Children’s Research Hospital! I did a quick practice juggle before the game and got 154 juggles. Nothing crazy or near my record, but I just wanted to get in a few strikes before my official Juggling for Jude kickoff when school ends! Please spread the word to any other players you know who might want to join me and Juggle for Jude this summer. They can go HERE to find out how. Also, my donations page is up and running, so please DONATE here if you can! Previous postJUGGLING FOR JUDE IS BACK FOR SUMMER OF 2015 and ALL KIDS CAN JOIN THE EFFORT! Next postJuggling for Jude 2015 Day Three: 326 Juggles and Some Big Thoughts About Stress Relief and Focusing on what you LOVE! !